RIOC's ax broke hearts on the Rivercross lawn, today. "They killed the TREE!" Georgette Sinclair cried. 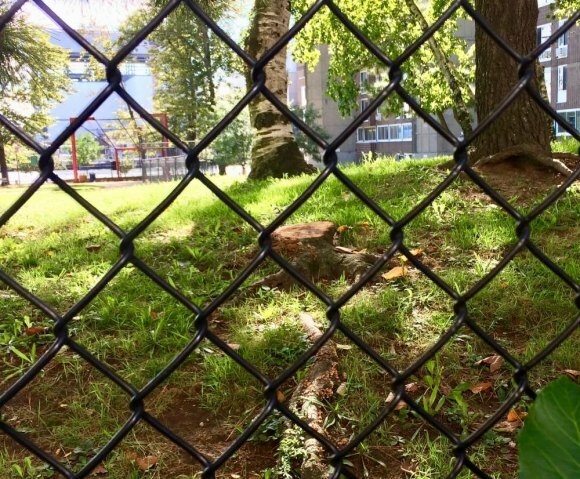 "I am on the way to work, and from the bus I just saw people cutting a beautiful tree on the area by the meditation steps!" RIOC's absence of communications or engagement with the community, all the hurt it causes, was out again in full force. 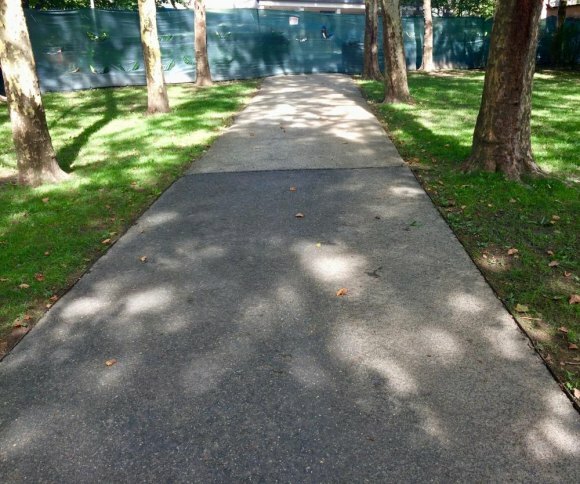 "Just a half an hour ago when I was on the red bus I heard a gasp of passengers, and when I looked up, one of the big trees on the green patch behind the Meditation Steps was cut down. Someone said, 'That hurts. 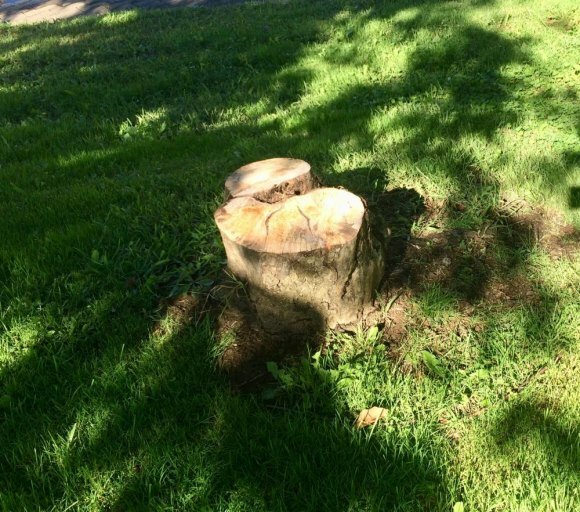 It wasn't even a sick tree,'" wrote another distressed resident. Added artist and Island House resident Georgette Sinclair, "I loved that tree, it was a fighter.... every year it was the last one to loose leaves in the late autumn season ... my heart is broken, why did they kill the tree? It was an old one, but still it was so beautiful .... Why? And Who makes the decision, what tree will live or will be killed?" A popular local painter, Sinclair is well-known for documenting graceful outdoor scenes on Roosevelt Island. I asked RIOC who was responsible and got the standard response: silence. It's not just trees. This path to Blackwell House was once lined with bushes. If RIOC's good at anything, it's passing the buck or, in this instance, pretending there's no buck passing before their eyes. A check with the Roosevelt Islander showed a response from RIOC's Public Information Officer Alonza Robertson, who after only six months has absorbed the agency's practiced indifference. 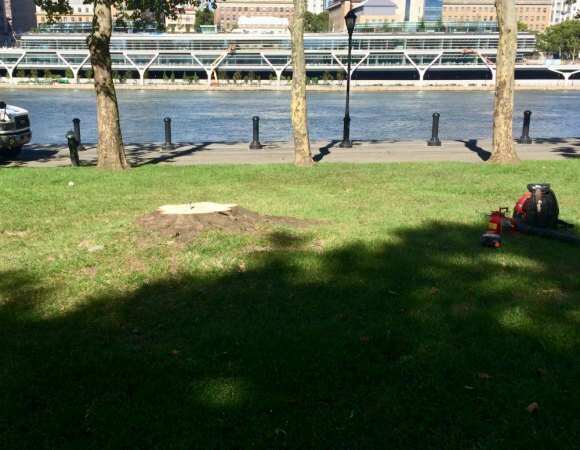 "It’s part of tree pruning work being done by RIOC," he's quoted in a post. 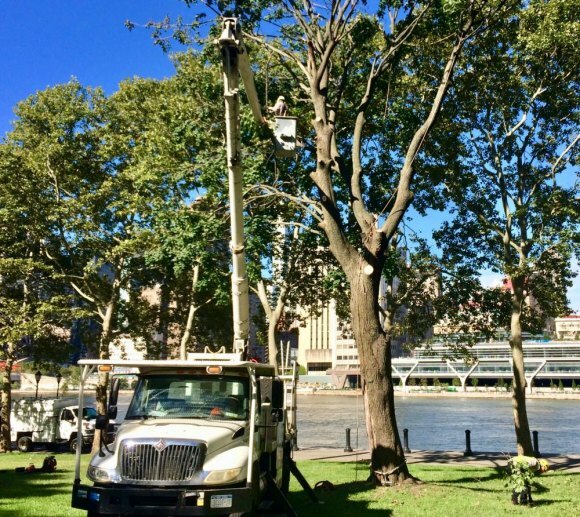 "Crews are conducting extensive tree pruning and removing dead trees at Southpoint Park, the Rivercross Lawn and Capobianco Field. Safety areas are set up around the work zones," he added with glib unconcern for residents upset by the destruction. "I’d originally set out an advisory about this on September 14," Robertson claimed. Did anyone see this "advisory?" I never got it, did you? "The dead tree at Rivercross a Norway Maple Leaf. We are looking to replace it." Another one's about to bite the dust on the Rivercross lawn. RIOC's been promising to replace trees taken down for years. In this case, residents disagree that it was dead, but instead insist it was thriving and beautiful. Where a once heart-stopping grove of graceful willows filled a space of lawn where the east path curls through Lighthouse Park remains empty after RIOC removed them all in a series of cuttings, years ago. 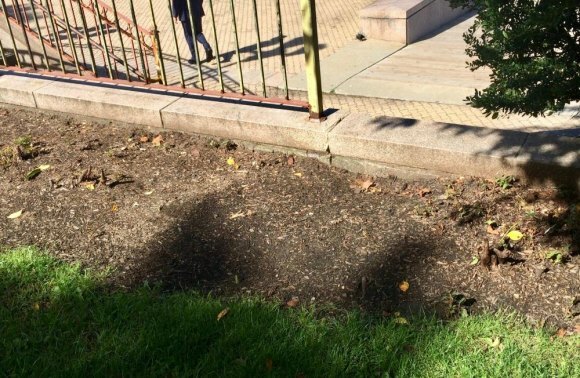 Five healthy trees were cut down by PS/IS 217 in a move suspected of being aimed at creating more free parking for teachers. Despite promises by the school principal, they weren't replaced either. Not long ago but what feels like another lifetime, Roosevelt Island won designation as "Tree City USA" in respect of our abundant arboreal environment. Outsiders have made a joke of it since. The Roosevelt island Residents Association Common Council was similarly and unpleasantly surprised. Abandoned tree stump, Octagon Field. "No, RIOC did not contact the Island Services Committee," said Co-chair Rossana Ceruzzi. "It is not just about replacing them, but most importantly, why are they cutting them? Please allow me to add that wildlife lived on and inside those trees." We've lamented RIOC's cluelessness before and the cruelty that results. Residents feel victimized by the State's indifference. Bushes uprooted overlooking the landing, stubble left behind. "I've lived on the Island since 2002," a resident who prefers to go unnamed continued, "and saw a lot of trees cut down. No replacement. What can we do as residents? Who can protect our trees? Is there an entity that requires tree replanting with the same type of a tree? "Are there tree protection organizations on the Island or in the City?" 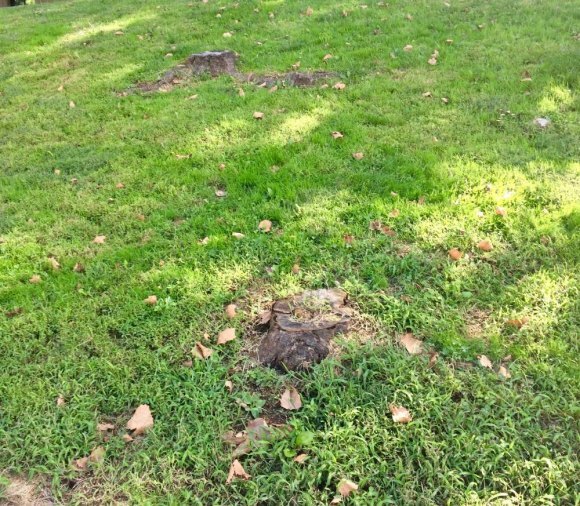 Stumps of cherry trees taken down, years ago, from the grove north of the Meditation Steps. "The helplessness hurts so much, and you can't do anything after the tree is cut. Sorry, too late, even if you had a different opinion about the state of health of the trees."